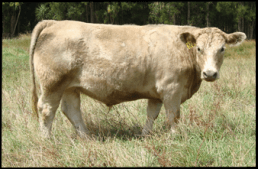 Many beef cattle have been bred to be larger and heavier over the last few decades. 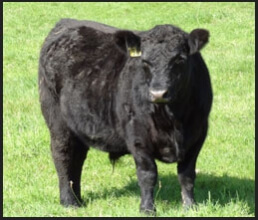 These animals no longer resemble their ancestors, eg, the original Angus bred in Scotland. 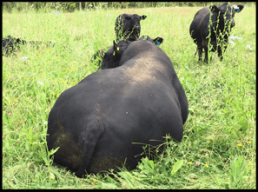 Large animals take several years to ‘finish’ and are often too heavy for the pastures on poorly draining soils where pugging occurs in the wet months. 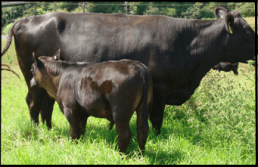 Few beef farmers in New Zealand have tried Lowline bulls over their yearling heifers, but in Australia, where there is a huge beef cattle industry, Lowline bulls have given yearling heifers trouble free calving while still producing a quality product. Our Lowline/Charolais steers and heifers were particularly impressive, reaching good commercial weights at 16-20 months. The photographed Lowline/Charolais steer, fed only on grass in the drought summer of 2009-2010 weighed, 434kg liveweight at 16 months. Although we are no longer breeding and selling Lowline Cross Cattle we will have a few on the farm until late 2017 if you wish to come and see what they look like.